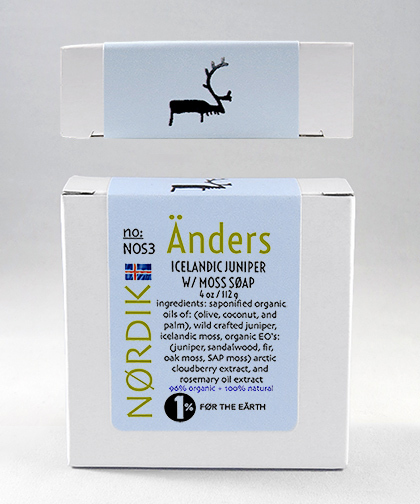 We added a little ground Icelandic Moss for its soothing action to Arctic Cloudberry Seed Oil that protects and strengthens the skin, and then we blended in Juniper, Fir and Sandalwood organic essential oils to make a great Nordic soap. Steam distilled from the needles of the Fir tree. Fir essential oil has a sharp crisp, clean scent of fir needles. Fir essential oils comes from the tree that grows widely across areas of northern Scandinavia. The Scandinavians used Fir Needles in the sauna, and it was used as an aromatic in bedding. Fir essential oil is especially effective in the relief of muscle pain. Steam distilled from the wood from the Sandalwood tree, this essential oil adds a very seductive element to this soap. Sandalwood essential oil imparts a warm, rich woodsy scent. Sandalwood essential oil is used in many perfumes as it evokes a dark sensual aroma. The oil is very calming and focusing and is used in many ceremonies around the world. To produce Sandalwood essential oil It takes roughly 50 years for the tree to be mature enough to be harvested, which makes this oil very expensive.